The Jewish Community Center of Youngstown provides a safe, welcoming, environment for children to have fun and make friends. Our year-round youth programming allows kids to have unique experiences in culture, sports, games, and friendships. 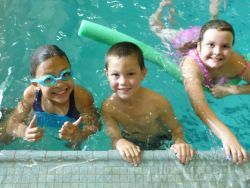 At the JCC, children are exposed to music, art, cooking, reading, team building, athletics, travel, and fitness. The Youth Department is devoted to continuous programming for children ages 6 months - 18 years old including: Aquatics, PJ Library, B'nai B'rith Youth Organization, After-school Programs, Performing Arts, and Camp JCC. At the JCC, each child's individual talents are celebrated in an environment that fosters fun and learning. All members of the Jewish Community Center are encouraged to attend our outstanding and distinctive programming opportunities.